By Greg Duck Posted: November 9, 2018 5:25 p.m.
Mark Cote, geography and environmental studies instructor and independent author, was awarded the Whistler Independent Book Award (non-fiction) at the Whistler Writing Festival this past October. The award was for his book, That Lucky Old Son, a tribute to his father’s experiences as a World War II bomber air crew, and prisoner of war. Cote was on a decade-long mission to learn all he could about the man that passed away when he was only a child – and to tell his story. Gathering the many stories and memories that are now contained within the pages of the book meant having countless conversations with his father’s crew mates, other veterans, and their families. The four-day long Whistler Writer’s Festival is an event put on by the Whistler Writing Society and features writing workshops, readings, discussions, and awards. Now in its 17th year, the event attracts almost 2,000 people, including notable Canadian musicians, authors, and poets - such as Peter Carey, Eden Robinson, and Esi Edugyan. Independent books, including entries from every province across the country, were submitted to the award selection committee. Shortlisted authors were then invited to Whistler to attend an award ceremony as part of The Literary Cabaret - one of the festival’s events. “It was truly an honour to be in the company of and to be able to glean from all of the other authors. I was truly impressed by the other finalists' skill and dedication to the craft,” said Cote. Cote is happy to have received the award, and knows that he would have made his father proud by using his education and talents to tell the story of those who could not. With the extra exposure from the win, Cote is hopeful that his message will reach an even larger audience. Visit Mark Cote’s website to purchase a copy of That Lucky Old Son. 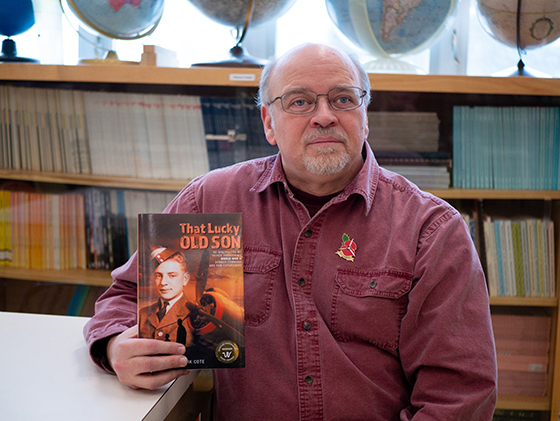 Read more about the book from A son’s quest to uncover his father’s wartime experiences. Learn more about the Whistler Independent Book Awards and the Whistler Writer’s Festival.